How many ways to cook Okra? This was the question on my mind today, I had some fresh Okra in the fridge that was begging me to make something exciting with it! It had been lying in the fridge for a week now while I was busy procrastinating. I usually feel bad when I waste food or have to throw something away, so I finally succumbed to it. Today, I had a moment of clarity and ta-dah!! While the traditional recipe requires peanuts/ groundnuts as a stuffing, I wanted to try the same using almonds, for a change to see what happens and much to my surprise almonds proved to be a good substitute. Into a pan, seperately dry roast the almonds, chickpea flour & sesame seeds, this may take 3-5 mins on medium heat. Ensure that the almonds & sesame seeds catch a bit of color. The chickpea flour should release its aroma & slightly brown. Using your fingers mix them all together to form a dry, semi doughy consistency (as shown in the picture). Taste now to ensure all the flavors are balanced. Once all the okra is stuffed and ready, to a hot wok on medium heat, add oil, once hot add the curry leaves & cumin seeds then add in the stuffed okra. Mix to coat in oil and reduce heat to lowest possible. Lightly season with salt and cook with the lid on by occasionally stirring to avoid burning. 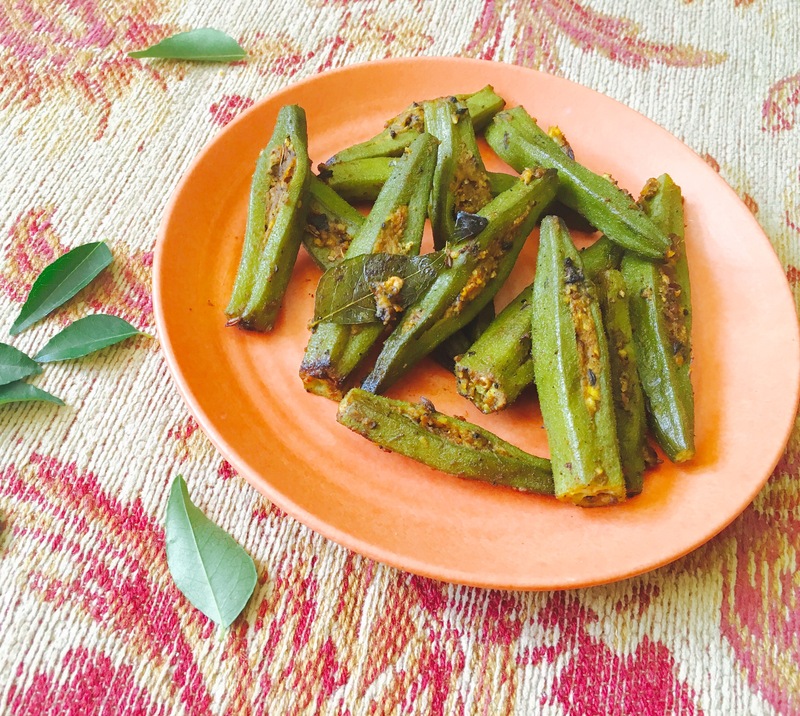 Cook for a 15 mins or until the okra is slightly soft and cooked through. This can be had with Rice & Dal or just on its own if you fancy! It can also be a vegetable side along with a meal. Note: Pls, pls, pls ensure the okra is completely dry after washing! 😀 that’s the exact feeling I had about the Okra when I thought of cooking it this way! Made me want to pick it up and get started! Enjoy! Sure, pls do and let me know how it turns out!